My mum is excellent at making soup. My childhood winters were filled with the most delicious leek and potato soup with crispy bacon, or carrot and coriander soup with crusty bread. However, when it came to tomato soup, it was always from a can thanks to good old Mr Heinz. As a result, I avoided tomato soup from the age of 18 until this afternoon, when I decided to have a go at making it myself. I bought some of the tastiest looking vine tomatoes I could find, a bunch of fresh basil, and some mature English coastal cheddar (for the mandatory grilled cheese on toast that accompanies tomato soup). The result was this tasty classic tomato soup. I wanted to keep it healthy, so I avoided putting cream in it. Instead, I added a small amount of potato to thicken it a little. I also added a splash of balsamic vinegar to give it a little more depth of flavor. 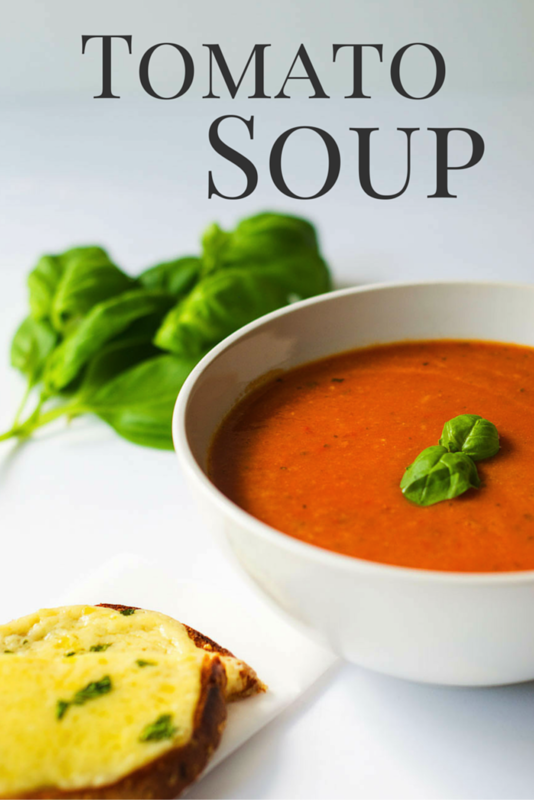 In terms of nutrition, this soup is low in fat and sodium, while being high in fiber, Vitamin A, and potassium. It is also rich in disease-fighting lycopene – the antioxidant that gives the tomatoes their red color. Heat the oil in a large pan over a medium heat and add the onion and carrot. Cover and cook for about 5 minutes until the vegetables are slightly soft. Add the tomatoes and potato, cover, and simmer gently for about 5 minutes. Add the stock, balsamic vinegar, and salt, cover, and simmer for 10 minutes. Remove the lid, add 2 tbsp of the basil, and simmer uncovered for 5 minutes. Add freshly ground black pepper to taste, and a little more salt if needed. Serve with a sprinkling of the remaining basil, and a side order of grilled cheese on toast. Looks great – simple and nourishing especially for those is us hitting winter. Look forward to trying it. It might be small but it is a mighty soup repertoire. This looks so good. I love the idea of potato to thicken it. I will be trying this out soon! Thank you Anne. I only added one medium potato and it just thickened it slightly. You could add another if you want it even thicker. I might try that next time. Love tomato soup so I’m going to try this one as it looks yummy think I will try it with fresh tomatoes as I grow my own.Hope it turns out ok.THANKS. Thanks for your comment Carol. If you make it I’d love to hear how it turns out.